Another heavy tremor just occurred at 6.01 a.m. in Maitama, Abuja. Truth is, this seem like a warning for an earthquake. I think the authorities should do some scientific investigation or evacuate residents as a matter of precaution. Anyone else in Abuja feel this? Two days ago I felt a tremor. This morning I just felt another strong one. What’s going on in Abuja? Bombs? Construction work? Earthquakes? Someone should please tell us! Abuja wey dey for di north central part of di kontri, na area wey get many rocks and small small hills dem. For some areas for di city, many pipo dey do illegal quarry bizness, wey be say dem go dey break dis rock dey sell. 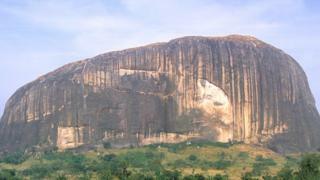 Di areas wey e happun pass na for Mpape and Maitama areas, wia plenti of dis rock blasting dey happun pass. Di Federal Emergency Management Authority (FEMA) for di FCT, come tweet say make pipo no panic. On 5th September, 2018 we received in our Watch Room, reported earth tremor in some communities residing in the FCT. Our Experts are working hard to determine the caused of the tremor with a view to advising the Government on What to do. However, we are advising all residents not to be panic as this is normal with the climate change. Should there be any further disturbances, you are kindly advise to always call the Toll Free Emergency Number 112 for our prompt response.